Shedding a light on the darkness of black racism. I have been incredibly busy over the past few days as I'm sure you can tell. So I apologize for the absence. I have one story that was at the top of my stack that I really wanted to post, but I haven't had the time to do it until now. It's a story that really caught my eye a few weeks ago. When progressives talk about racism, frankly they should be smacked upside their head like if they were in a V8 commercial. Since they live in their delusional bubble, they never have to worry about being called out for they own hypocrisy, when it comes to displays of racism. It seems that some progressives have a problem with anything related to interracial couples or bi racial children. I have yet to hear a liberal ever acknowledge that Obama is biracial himself and that his mother was white. Now of course if Obama wasn't who he is, then he would be called biracial instead of being called black by those who want to claim him as such simply because he was elected president. A few weeks ago, a liberal who worked for MSNBC was caught up in a fire storm after making a rather stupid tweet claiming that the GOP wouldn't like the bi racial child in the Chererois ad that ran during the Superbowl. I wasn't shocked when I first heard about the tweet. Coming form MSNBC, it's all liberal, all race all the time, so what else is new. Now when the Republican National Chairman Reice Priebus called for a boycott of MSNBC in response to the tweet by the now former MSNBC worker, progressives were quick to attack Mr Priebus however in calming the the ad hit sore spot, because it had to be true. I started noticing after this incident how liberals are always trying to make ordinary non controversial issues into racial ones. I thought back to how Melissa Perry Harris and her guests singled out and used the black grandson of Mitt Romney in a family picture to attack him and the GOP.. This is the story that caught my eye and really shows how fake the progressive left is on the issue of race. Tamera Mowry was a child star on the television series "Sister Sister". All was fine with Tamera until she made the "mistake" of marrying Adam Housley. Now many people don't even know who Adam Housley is. Adam Housley is a Los Angeles correspondent for none other then "Fox News:". You can picture where this is going, black woman marries a white guy who works for Fox News. As some of you may have guested, Tamera has been called a "white man's whore" and other sickeningly vile names because of her marriage to Adam. This is an interview with Adam and Bill O'Reilly on what Adam and Tamera have gone through. After reading comments like these, I can understand why Tamera broke down and cried during an interview with Oprah. I can only imagine how Mr. Holmes felt about Barack Obama's mother and for that matter Barack Obama Sr. Then again, I'm sure Mr Holmes would say he loves Barack Obama Jr though, of course. Why GOP Response to Demographic Shift Is to ‘Screw the Minorities? How does a black person get screwed out of voting? I've been voting for well over 20 years, and I have never been "screwed out of voting", well at least I don't think I was. 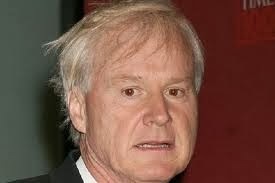 The "screwed out of voting" lingo is yet another terminology created by Chris Matthews. Mr. Tingles this past Thursday had on his lowly rated show the former Governor of Florida and political opportunist Charlie Christ. Of course with Chris Matthews the topic was going to be about race, and the dastardly evil doers had to be the GOP. It's just his typical template which makes him so predictable. Anyways Matthews asked Christ about his former party. Apparently according to Chris, the GOP has a defacto war on minorities going on when it comes to voting. The war must have started after I left the Republican Party I guess. Chris asked Crist "Why does your ex-party think the way to fight the demographic changes in this country is to screw the minorities?” I was trying to comprehend the rambling by Chris on minority voting. I guess he was saying that minorities get screwed voting wise in Florida due to the state not having early voting. If I am understanding that right, then my question would be, "how were minorities voting before the concept of early voting came along"? Him showing black people in line to vote was suppose to symbolize what? I stood in lines on election days and thought nothing of it. Was I being screwed out of voting even though I voted every time I stood in line in each election cycle? Maybe Chris believes minorities are too pitiful & hapless to know how to plan to be in line on an election . I suppose next Chris will claim that the GOP is going to have members of the Klu Klux Klan positioned in minority voting places like the New Black Panthers were in Philadelphia. Anything is possible with that ever deranged clown Mr. Tingles.